BoyRaket.com: Breastfeeding and Work: Let's Make it Work! The event will feature both international and local world-class breastfeeding experts. The international speakers will come from the Academy of Breastfeeding Medicine (ABM), a worldwide organization of physicians dedicated to the promotion, protection and support of breastfeeding and human lactation. They include Dr. Arthur Eidelman, neonatologist and past president of ABM; Dr. Jennifer Thomas, pediatrician and a public health expert who recently co-authored her first book, Dr. Jen’s Guide to Breastfeeding; Dr. Miriam Labbok, a senior advisor for UNICEF HQ on Infant and Young Child Feeding and the Chief of Nutrition and Maternal Health at USAID; and Dr. Julie Smith, an economist who is currently working on her research on the economics of breastmilk. PPS also invited speakers from the Philippines who will share their expertise and experiences on breastfeeding. Dr. Ryan Capitulo, a distinguished obstetrician, will present the joint position statement of PPS and the Philippine Obstetric and Gynecologic Society on breastfeeding. Dr. Ma. 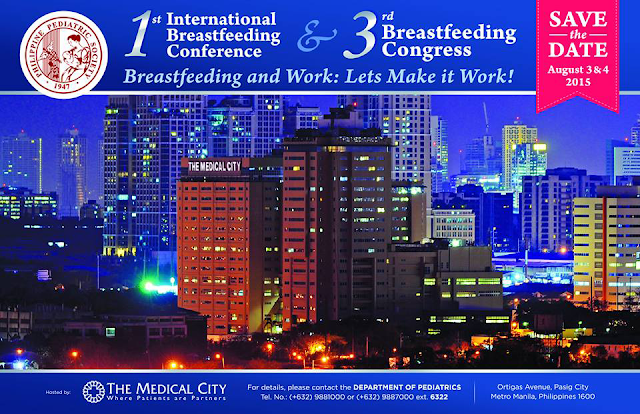 Naval Rivas, a paediatrician, will discuss how to achieve a breastfeeding friendly physician’s office. Dr. Sharon Gianan-Cruz, a respected obstetrician, will speak on the role of fathers in breastfeeding and how fathers can become the tool for a successful breastfeeding experience. On the other hand, Finance Secretary Cesar Purisima will share his experience as a father of a breastfeeding child. Fellow paediatricians, Dr. Blesilda Concepcion from The Medical City and Dr. Estrella Jusi from Jose Fabella Memorial Hospital, will share how their respective hospitals responded to the call to action on how to become one of the first private and public PPS accredited Mother-Baby Friendly Hospitals in the country. Another highlight of the Breastfeeding Conference is the launch of the World Health Organization (WHO) / UNICEF’s Baby Friendly Initiatives. These Initiatives include Mother-Baby Friendly Hospital Initiative (MBFHI), Baby Friendly Workplace Initiative, and for hospitals already with full MBFHI accreditation: Neo Baby Friendly Hospital Initiative and Baby Friendly Community Initiative. Representatives from different PPS accredited hospitals, supporting organizations and lead partners will be invited to discuss their experiences and together come up with improvements in the local setting through collaboration and networking. This will be a continuing event in the future Breastfeeding Congresses for the next five years. The Breastfeeding Congress will also feature the Kangaroo Mother Care (KMC) workshop and the Wellstart Breastfeeding workshop. KMC is a method of care of preterm and low birth weight infants which involves infants being carried, usually by the mother with skin to skin contact. The KMC workshop is intended for health professionals responsible for the care of these infants. The Wellstart Breastfeeding workshop on the other hand aims to equip educators of the Wellstart Breastfeeding curriculum from PPS accredited hospitals, with the basic skills needed in the training of students and residents regarding breastfeeding.